People love super foods, and any food that comes packed with health promoting nutrients and ingredients is always going to be popular. The great thing about pineapple in particular is that here you have a super food which is also tasty and tropical. You can sip pineapple juice feeling like you’re on holiday while at the same time improving your health in all manner of ways. Here we will look at what pineapple juice can do for you. Pineapple juice is high in antioxidants. This is good news because antioxidants protect you against aging and cancer by eliminating free radicals in your body. These free radicals are loose cannons and normally bombard your cells causing visible damage to the exterior and more serious damage to the DNA resulting in mutations and possible cancer if they are to get through. By consuming pineapple juice you are able to prevent there from being as many antioxidants in your body and that means that you will experience fewer visible wrinkles and blemishes and reduce your chances of developing cancer. There are many minerals and vitamins in pineapple. For instance it is a very good source of vitamin C which as we all know by now can help your immune system to defend itself against all manner of diseases and infections. At the same time it is also high in vitamin B1. Like many of the B vitamins this is useful for converting sugar into energy so this can help you to get a great energy boost. It is also high in magnesium, calcium (for the bones) and several other minerals which all play different vital roles around the body. Pineapple is also high in bromelain which is an anti-inflammatory agent (meaning it reduces the immune response that causes swelling). This can be used for treating injuries and arthritis. If you have arthritis then you should make this your favorite drink. If you have a sore throat or have had an injury then it’s a great drink to help you recover (it will also help you to restore sugar levels if you are in shock). One of the most often touted benefits of pineapple is its ability to improve the digestive system. This is again because of the Bromelain which helps to break down proteins. Proteins such as red meats are often a cause of indigestion and digestion problems so this is a great aid to the digestive system. Pineapple juice is a natural diuretic. This means that it can help to empty the body of toxins and also help to lower blood pressure and prevent weight gain. 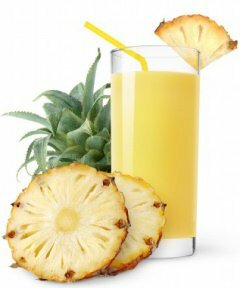 As well as being a natural diuretic, pineapple juice also contains small bits of fiber that can help to de-clog the digestive and intestinal tracts and reduce arterial plaque and blood pressure etc. A definition of the key terms would have greatly helped. Very helpful, didn't know this information!